Why? The Grand Bargain, drawing on the report of the High-Level Panel on Humanitarian Financing, argues for ‘localisation’ because it will be more costs-effective. Unfortunately, who gets what share of the money has become a major consideration, and source of resistance to effective localisation. The framework has been tested with various local CSOs and is actively used e.g. by the Start Network, other INGOs, and UNICEF. But a broader perspective is needed, that asks more strategic questions. How do we make our collective, global, or ‘system-wide’ capacity better prepared to respond to a crisis in ways that maximise the participation of affected populations and reinforces rather than replaces local and national capacities? What will make our own organisation better prepared to do this? What strategic decisions for a particular crisis response, will create enabling conditions for this? 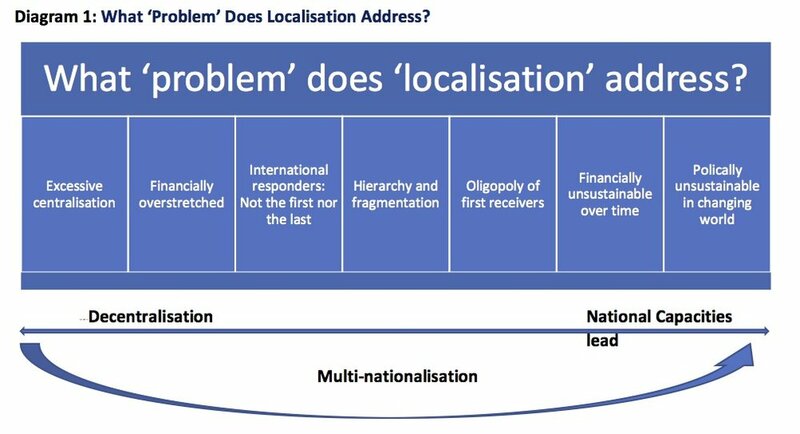 What does localisation mean for our individual (and collective) operational practices? Localisation In Conflict Situations: Not Holier Than You?! Most Training Does Not Develop Organisational Capacity, What We Need To Do Differently? Inline with commitment to localisation, the objective of this project is to identify good practice and principles of equitable partnership and accountability. This will be achieved by local organisations sharing their own definitions of 'partnership principles' and 'accountability standards'. Through carrying out consultations and interviews with local organisations in various contexts, this project will compile indicators of partnership principles and accountability standards from the local perspective. Taking an inclusive approach, the methodology will be developed by local actors to measure progress. This will provide a simple means by which the local organisations can assess the progress towards equitable partnership and accountability. It will help in building trust and credibility with partners, donors and the general public. This project will be carried out in collaboration with COAST Trust in Bangladesh and Syrian organisations. We will also look for collaboration with like-minded organisations who would like to contribute to localisation and a more effective aid system. Let the local responders lead in Sulawesi Tsunami Response: Duplication of Mistakes will become Luxury"
Our thoughts are with the people affected by the Tsunami and the local and national responders who have been trying to respond in the aftermath of the destruction caused by the Tsunami. We commend the efforts of local people to deal with search, rescue and assistance in the absence of outside help. In solidarity with the affected people, and In light of the appeals for funds to respond to the disaster around the world we urge that the International Actors and donors respect the commitments they have made in the Grand Bargain and Charter 4 Change. We urge the donors to ensure that the international actors they are funding adhere to the commitment on Accountability to Affected population, localization and transparency and accountability. Read our statement of solidarity. ‘Partnership’ is a much used, and abused, term by international cooperation actors, even for what local actors experience as a relationship of subordination. This blog gives a sobering flavour of how several local civil society leaders have experienced that relationship. It also articulates, for the first time we believe, how strong engagement with international agencies can constitute a real risk for local ones. The A4EP, which is a network of organisations committed to strengthen the humanitarian architecture, has produced this advocacy position paper, which aims to positively influence the debate towards transformation of the humanitarian system. A4EP urges the GB signatories and the secretariat to work in a more open and transparent manner, and in the spirit of equitable partnership, which is espoused in the GB. We urge the localisation work stream co-conveners to be more transparent in their decision-making and embrace more local actors to make it truly representative. Most of its meetings should be held in aid-recipient countries, not in Western capitals. The members of A4EP are ready to take their responsibility and work with the GB secretariat and the localisation work stream to achieve this. Syrian Civil Society And The Swiss Humanitarian Community, Challenge, Opportunity And The Future Of Syria. Publication: Geo Expertise, IHEID, December 2015. Publication : Tufts University, Feinstein International Centre, February 2015.